This piano has what's often called the Birdcage action. The correct name is the Overdamper action (or overdamped action). The name "birdcage" comes from the vertical damper wires at the front, fancifully imagined as the bars of a metal birdcage. 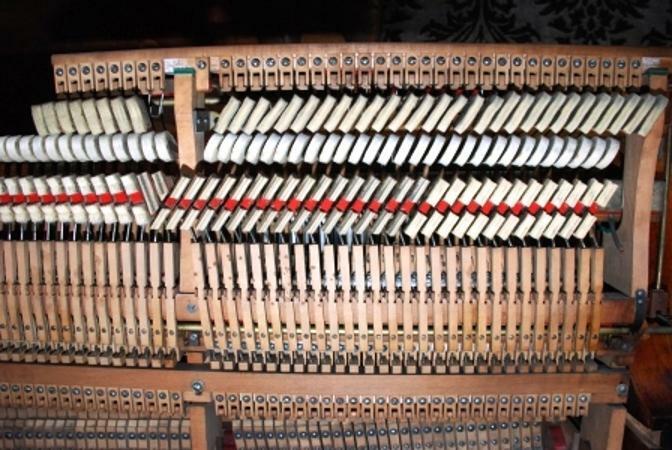 In Overdamper actions the felt pads - dampers - which stop the notes from sounding when you let the keys up, are above the level of the hammers, sitting nearer to the ends of the strings. 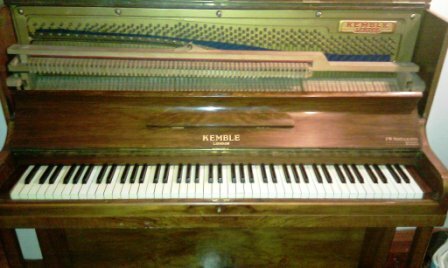 All modern upright piano actions are of the Underdamper type, with dampers below the hammers, further down the strings. 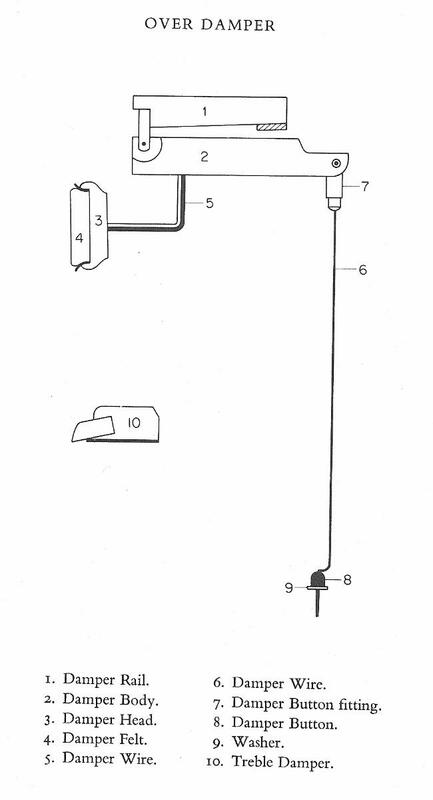 The photo below shows an Overdamper action from the hammer side, with the dampers above the line of hammers. 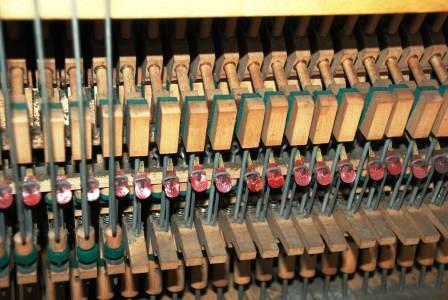 (Dampers do not extend into the high treble on any piano as the tones are of short duration there anyway). 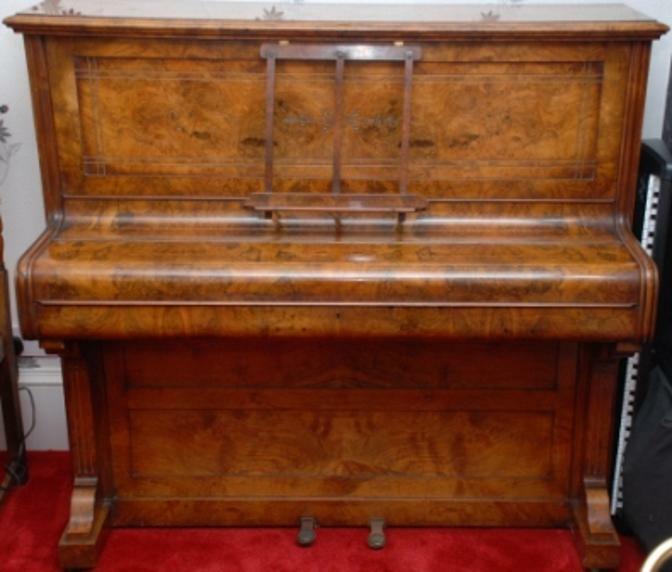 Overdamper actions were popular in budget-level British pianos around the end of the19th century. 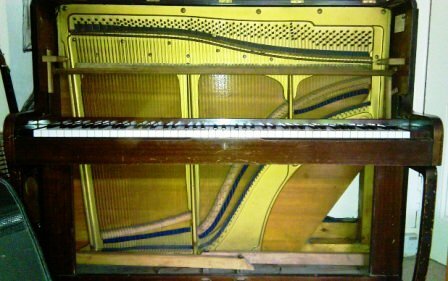 They were often fitted to straight strung - also called parallel strung - pianos, where the bass strings do not run across diagonally over the treble strings. A line drawing of the overdamper mechanism for a single note. It's shown without the rest of the action. The hammer (not shown) which strikes the string, sits just below the level of the damper. 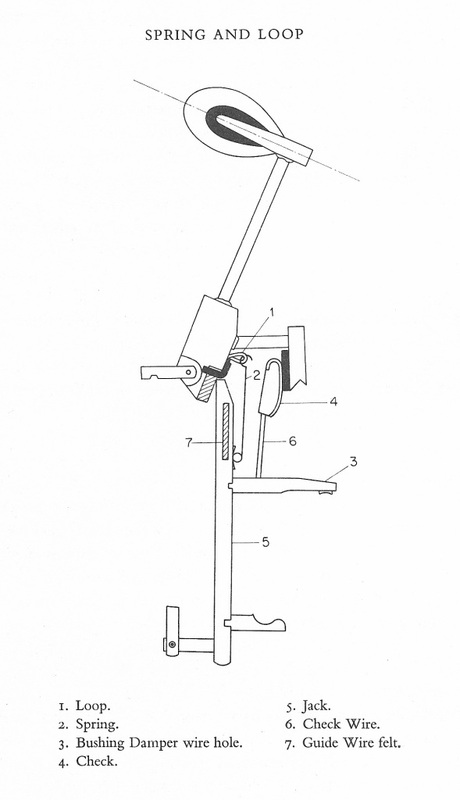 Compare with a modern upright action, with the damper below the level of the hammer. 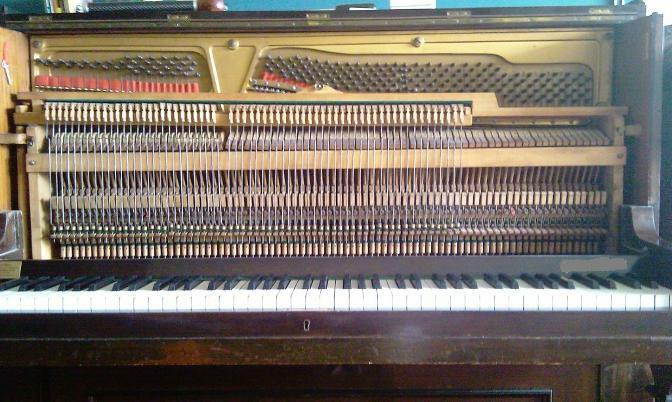 In that position it works more efficiently to stop the string from sounding. It's operated by a spring, which pushes the damper felt against the string. In the overdamper, only gravity keeps the damper against the string. Birdcage actions tended to be fitted to the cheaper, straight-strung pianos. Perhaps for some reason they were slightly cheaper to manufacture. In the late 1800s a thriving "cottage industry" of small piano workshops developed in England, making cheap and cheerful instruments to suit the budget of 'lower middle class' families, who by that time had the means and the desire to own a parlour piano. 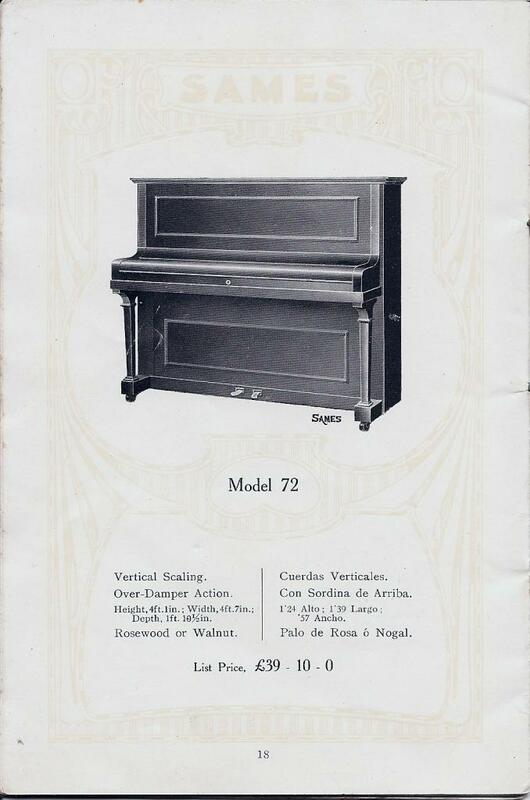 Scores of thousands of entry-level pianos were churned out by such workshops, cheaply made, to be affordable. 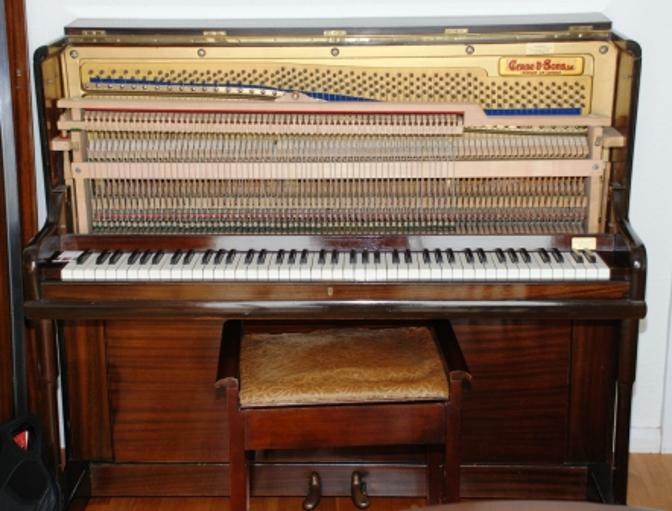 (There was a kind of upright piano around since the 1850s called the Cottage Piano - see the bottom of the Technical Info 1 page. That's not what I mean here by "cottage industry"; I'm using that term in its general sense). Isn't that exquisite? Even on the inside of the lid, seldom seen. As time went on finishes became less ornate. 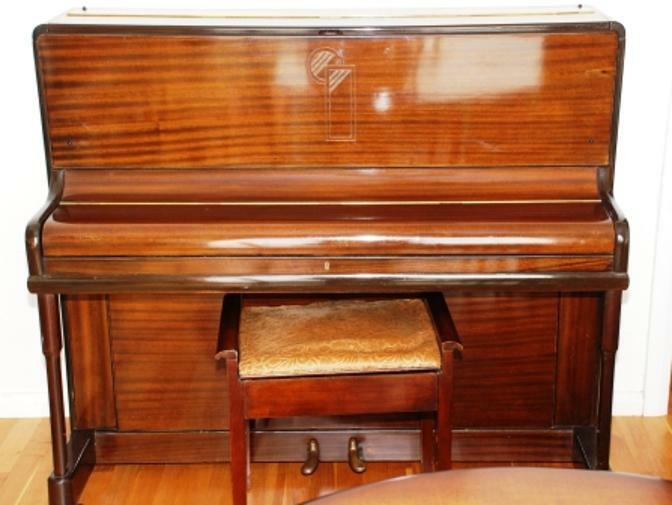 Here's a photo of one of the later Birdcage pianos, typical of the size and style produced in the late 1930s. 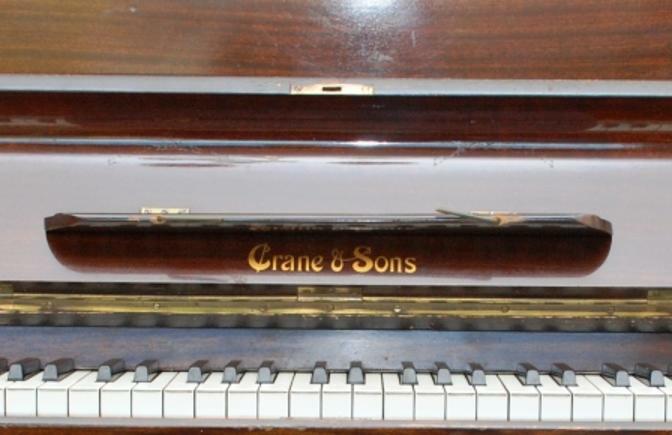 This serial number dates the year of manufacture to 1941, and Bill Kibby of www.pianohistory.info confirms that Kemble made pianos for Crane at that time. 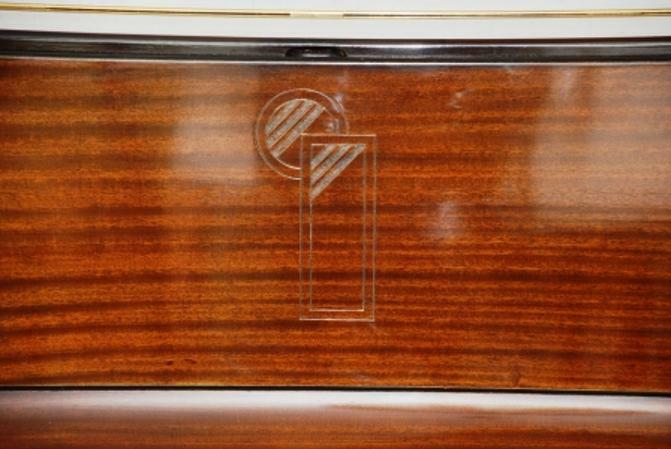 Here is a close view of the little motif on the top panel, rather Art Deco in style. 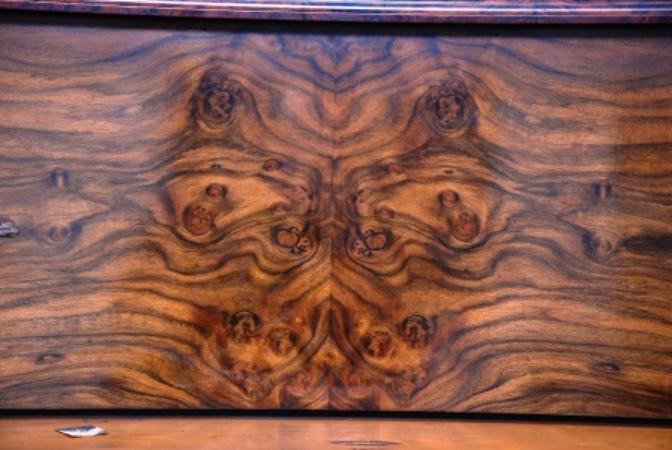 You may have noticed that the other piano of this type above, also had such a motif in the centre. 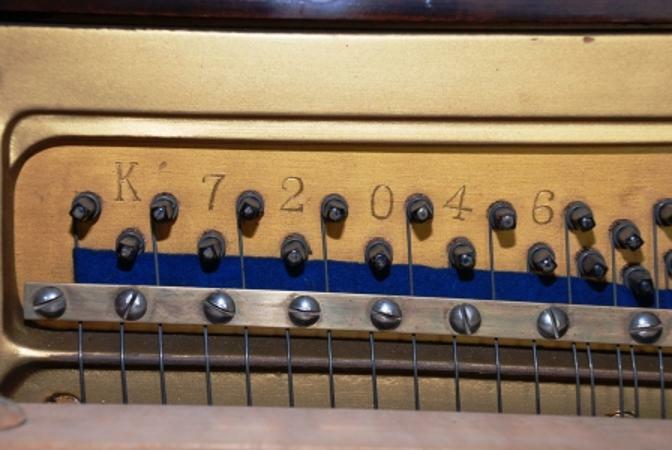 Although by the late 1930s, straight strung overdamper pianos were apparently being phased out in English manufacturing, Bill Kibby has pointed out out that they didn't entirely cease production until later. 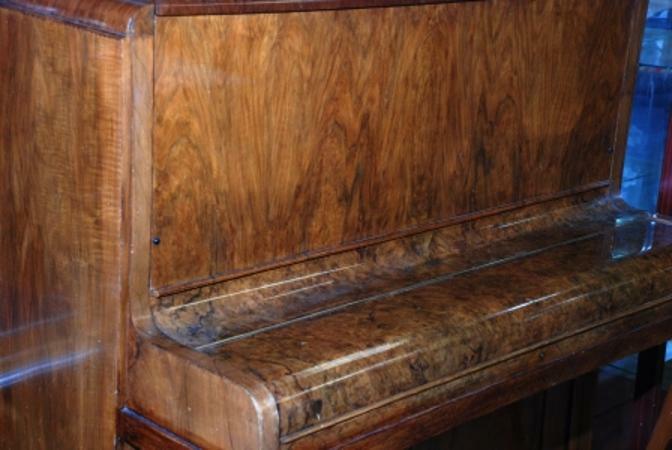 The English maker Berry produced overdamper pianos into the 1950s, with the last of them going out in 1954. It seems likely that these were made using pre-war leftover stocks of these actions. 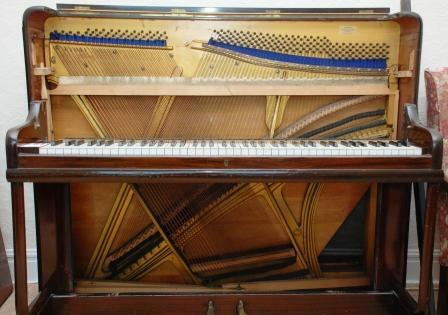 Piano actions are made by separate specialist companies, and Herrburger Brooks were the main UK action maker for many years. 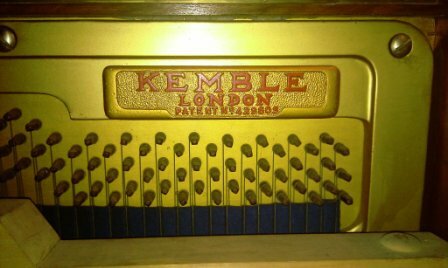 Kemble, incidentally, were the last English piano factory. 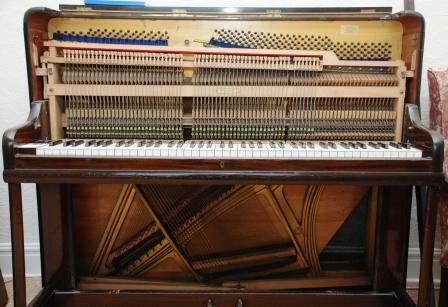 They ceased production in October 2009, effectively ending 200 years of English piano manufacturing (there is still some craftsman piano building going on, but not on a factory scale). 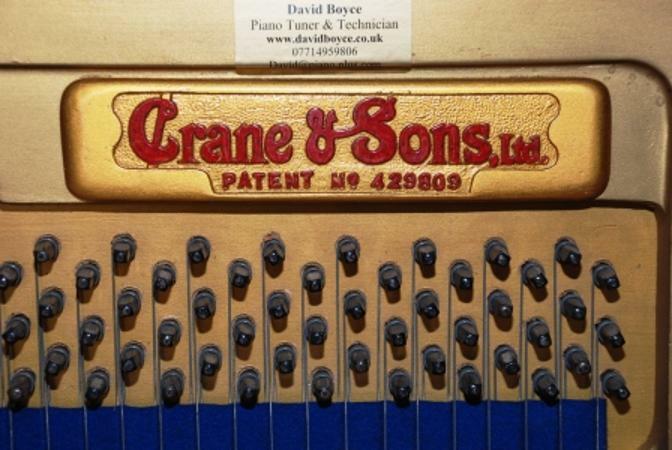 Like the piano above it, this one too has the Crane name on it. 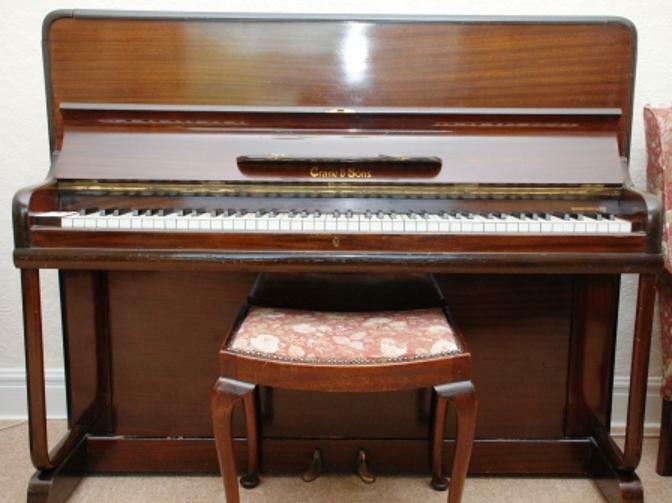 However, unlike the two Kemble pianos in the pictures above, this one doesn't have an Art Deco motif on the top door, and, ta-dahhh! it is an OVERSTRUNG birdcage. Here it is with the action out (again, photos thanks to gracious permission of the owner). 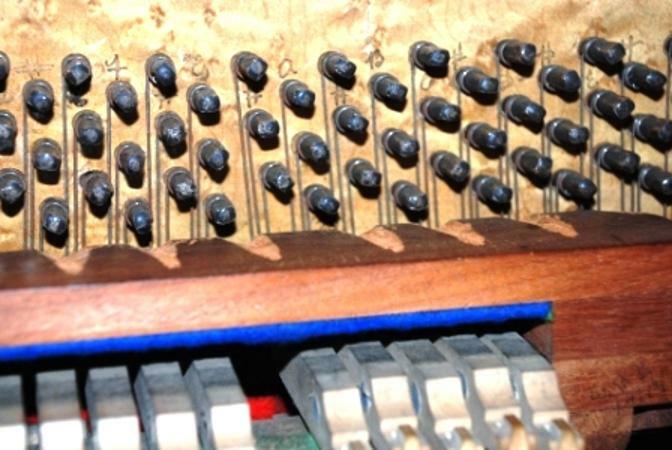 The photo below shows a really old birdcage piano where the damper rail partly obscures the bottom row of tuning pins. This piano can never have been properly tuned in its life, until I filed grooves in the damper rail to let the tuning lever get access. 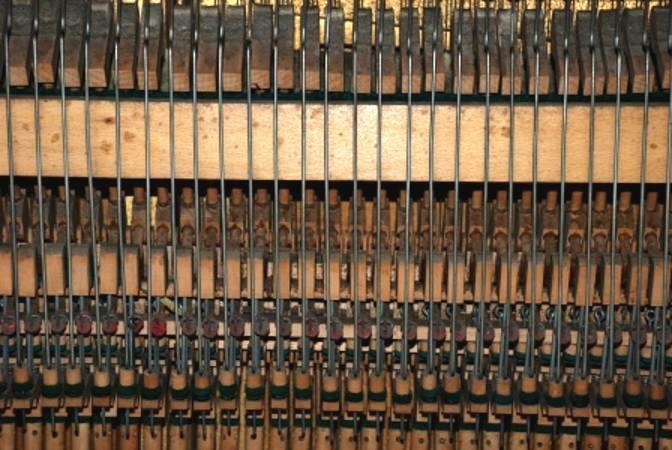 As it was made, you had to use the tuning lever to lever the rail down while simultaneously tuning and "setting" the pins; an impossible task. 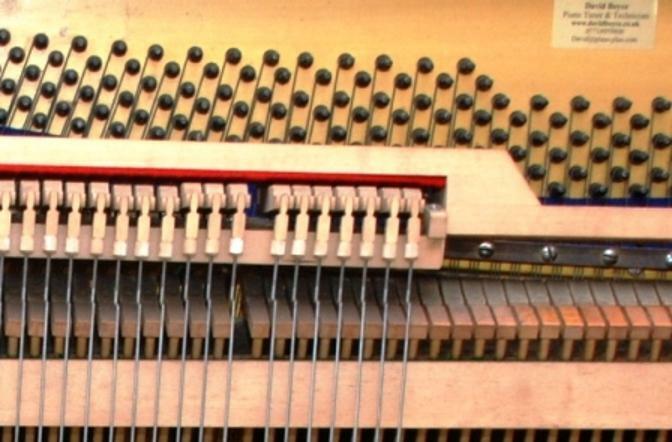 It's an infuriating aspect of many of the smaller overdamper pianos, that part of the bottom row of tuning pins doesn't quite clear the top of the overdamper rail and this makes it very difficult to seat the tuning lever properly on those tuning pins. There is really no excuse for this; it's just bad design, with only cost-cutting having prevented a solution. Overdamper pianos were also made in Germany. 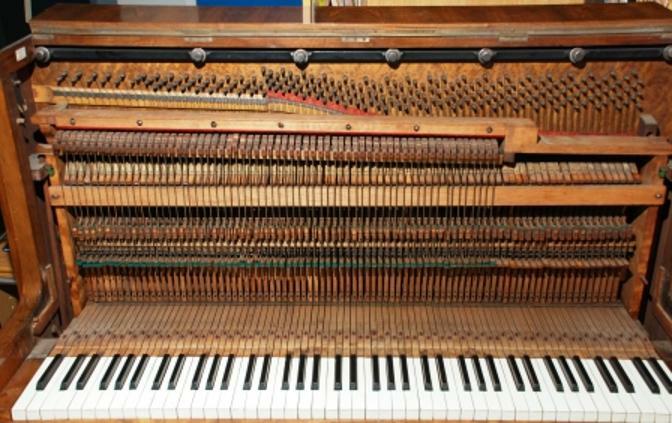 There, it was less of a bargain-basement thing: Bluthner notably made some huge and powerful pianos with overdamper actions - there used to be three of them in my immediate area. 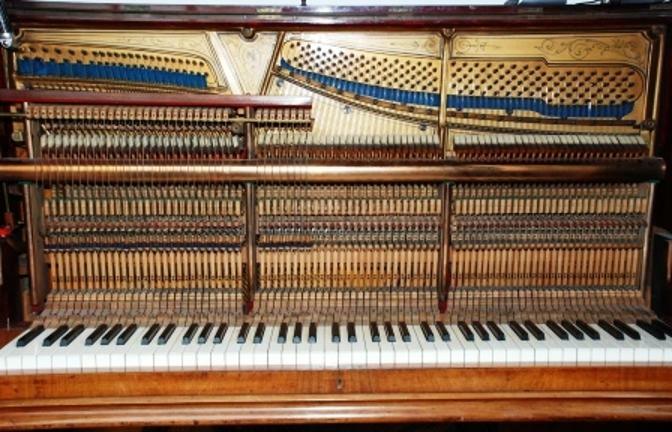 Ibach were another German maker who had overdamper actions in some fine pianos. However, the German makers did not persevere as long with that type of action as British manufacturers did. They seem to have dropped those designs some time around the First World War. 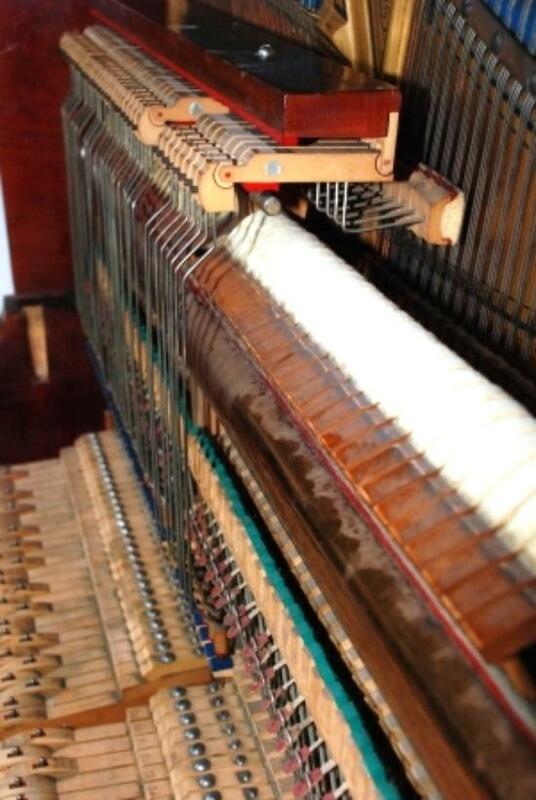 Overdamper actions do not "damp" the strings (stop them from sounding after you take your fingers off the keys) quite as effectively as underdamper actions, partly because the dampers are close to the ends of the strings where there is less string movement. The damping becomes even less efficient with age. 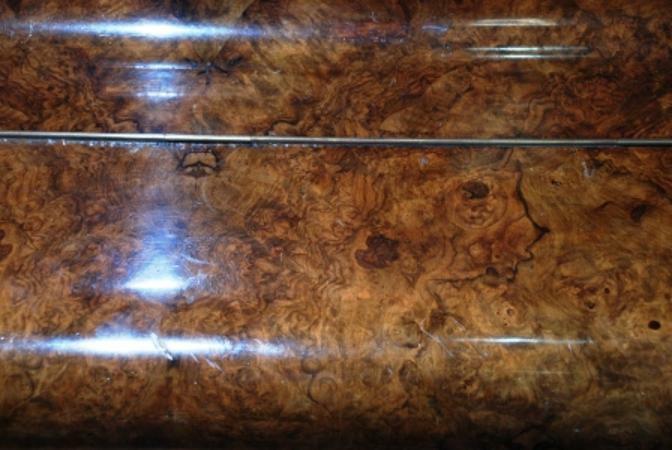 Here is a Youtube clip from Roberts Pianos in Oxford, showing one of one of the fine old Bluthner overdamper pianos, and comparing it to another one that has had a new underdamper action installed (a very labour-intensive and expensive job). They were certainly determined that the bass strings of that piano would damp! That's an awful lot of damper felt, both above and below the hammers! (The top rail isn't really curved, it's an artefact of the wide angle of the camera lens). An early variant of the Birdcage action was the Spring & Loop type. 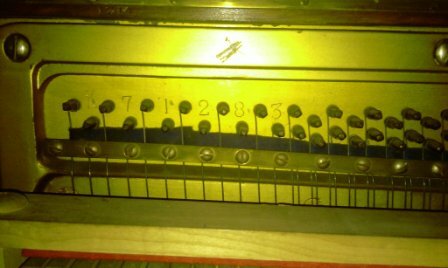 The top two photographs on this page show an Overdamper action of the Spring & Loop type. These actions were commonly used early on in the cheaper upright pianos. Later Birdcage actions had Bridle Tapes, more closely resembling modern Underdamper tape-check actions, and worked better. The geometry of Spring & Loop actions was inferior, and in my experience, they never feel responsive and, I think, did not even when new.. This line drawing shows a Spring & Loop mechanism for one note. It's shown without the overdamper, so you have to imagine the overdamper drawing above, in place here, with the damper above the hammer. 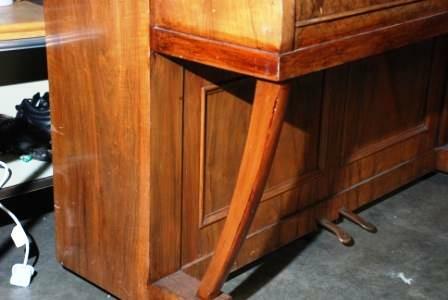 In Britain in the 1950s a fashion developed for "modernising" the casework of older pianos to make them look more contemporary. Ornate front panels were replaced with plain fronts without candle sconces. Straight legs were replaced with curved. Top lids were shortened so that they did not overhang, and rounded corner mouldings fitted. The refinished top panel does not quite match the keyboard lid (called the Fall). The top panel has been replaced with a plainer look, lacking inset panels and candle sconces. The finish on the Fall is original. All of such renovations were purely cosmetic. 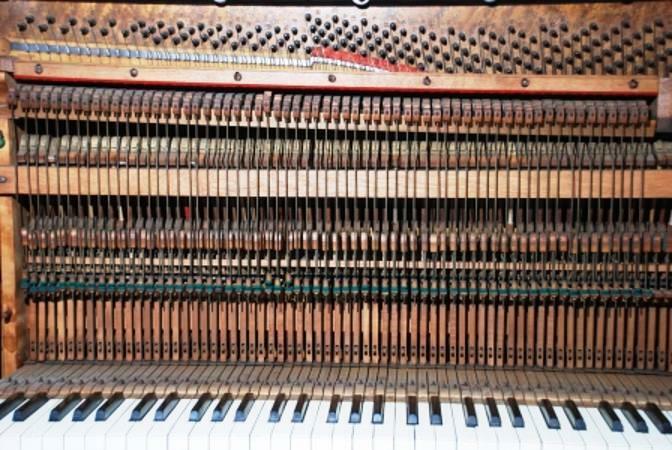 They did nothing to improve the operation of the piano as a musical instrument, or to deal with fifty or sixty years of wear to the action parts. But it did make the piano look younger. One client was very surprised when all this was explained to her. She insisted that the piano had been sold to her parents as brand new in 1957, but it was quite clear that it was a "modernised" piano. 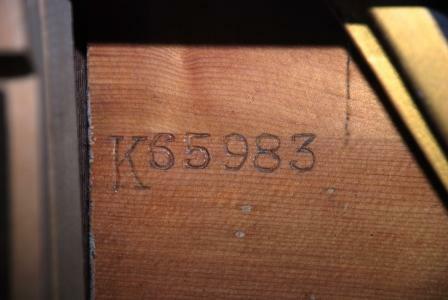 A 1918 date stamped on the piano's birdcage action helped to convince her. Should you buy a Birdcage piano? 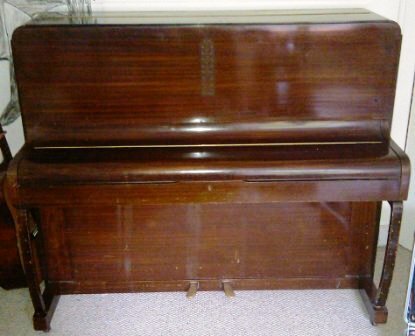 What is the upshot of all this, as far as buying or owning a Birdcage piano is concerned? Broadly, the advice must be: Don't buy one, and if you own one, don't expect that it can be improved. 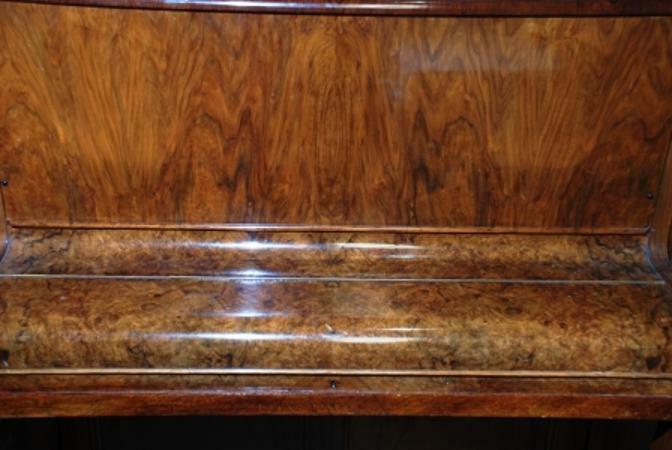 The high-quality German Birdcage pianos are now too old to be candidates for major improvement, unless for the very best-quality ones and in a wealthy area where people will pay a premium price for such a restored piano. 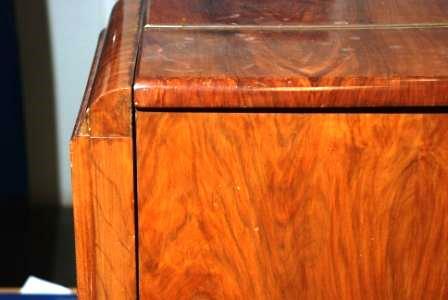 The later UK Birdcage pianos, from the mid 1930s to the early 1950s may still be decently playable, but they were of budget quality, and not worth any great expenditure. Worst of all are the late 19th century English cottage-industry Birdcage pianos, especially with the unresponsive Spring & Loop action. They were cheap to begin with, and are now around 130 years old. Action parts along with other parts of the piano do become fragile with age, and there's little scope to make such old brittle Birdcage actions serviceable. 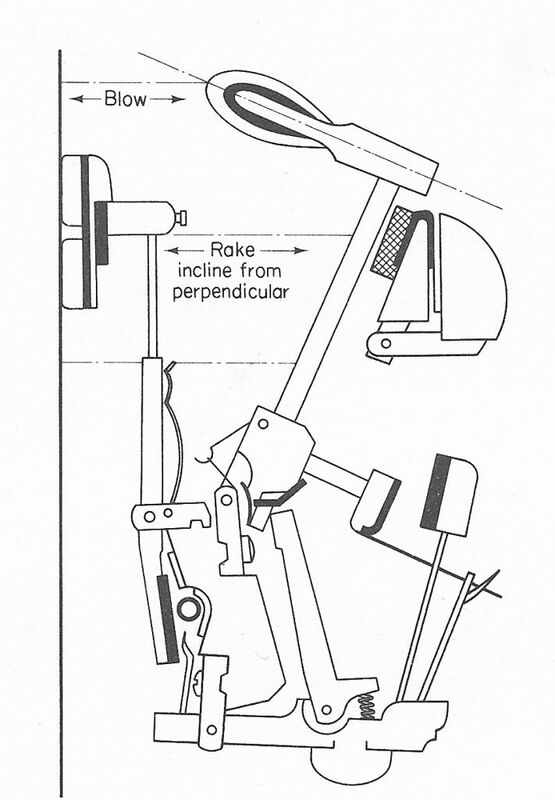 Line drawings on this page are from Piano Action Repairs & Maintenance K.T. Kennedy, Kay & Ward, London 1979, out of print.